Box of 1000 Guardhouse #7 Acid Neutral Glassine Stamp Envelopes. Guardhouse glassines are made of a PH neutral translucent 55 gsm (38#) paper. They contain no harmful chemicals or additives, are safe for long term storage, and are resistant to moisture, air, dust, and grease. 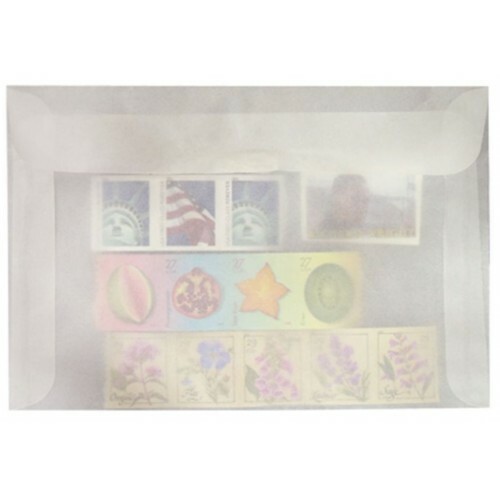 Guardhouse brand glassines are feature flaps folded on the exterior of the envelope, which leaves only a smooth interior pocket surface that will not catch on your collectible paper items. Flaps are ungummed so they can't be accidentally stuck to your philatelic material. Requires tape for closure (not included). Do you have any questions about 1000 Guardhouse #7 Acid Neutral Glassine Stamp Envelopes 4 1/8 x 6 1/4 sleeves?